Texas "License to Carry" Training Requirements to Legally Carry a Handgun in the State of Texas. [2015 Edition (Revised 2017) based on the changes that occurred during the 84th & 85th legislative sessions (e.g., open carry, campus carry, use of restraint holsters, place of worship volunteer security, storing & transporting of firearms & ammo by a LTC in a school parking lot, etc...).] This is the official manual of the Texas Concealed Handgun Association. 8.5 x 11 and Spiral-Bound. 50+ copies, $6 each. 10-49 copies, $8 each. 1-9, $12 each. CD/DVD VERSION - Usually Ships in 2 to 7 Business Days. The definitive lesson plan dealing with the Texas License to Carry (LTC) program and the changes that occurred during the 84th & 85th legislative sessions. CD/DVD. 2015 edition (Revised 8/11/2017). ELECTRONIC VERSION - SAVE $$ in Shipping Charges & Receive Files within 48-Hours. 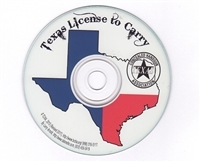 The definitive lesson plan dealing with the Texas License to Carry (LTC) program and the changes that occurred during the 84th & 85th legislative sessions. PowerPoint. 2015 edition (Revised 8/11/2017). NOTE: The files will be sent electronically via DropBox. No shipping charges are assessed on this item.